Lock in a great price for Delina Mountain Resort – rated 9.1 by recent guests! This place was absolutely stunning! The staff was really accommodating (the breakfast didn’t officially open until 9, but they got food ready for us early since we had to leave by 8:30 to catch our flight home) and kind. Stella in the spa gave what was probably the beat massage I’ve ever had! The room itself was super comfortable (wood fire, jacuzzi tub, lighted headboard, and towel warmers were all nice touches) and the on-site restaurant was nice. Nice location, friendly & helpful staff, good food, clean rooms, nice wood burning fireplace, and spa tub. Breakfast is delicious. A nice combo of sweet and savory items. Both couples and families had a smile on their face while staying there. Felt like it was a good value for the service level, property and amenities. Highly recommend if you are in the area! 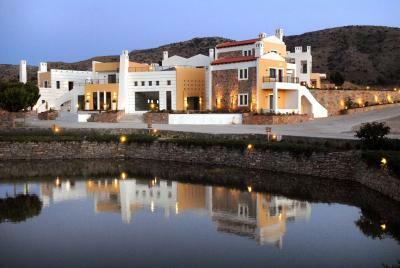 The resort was situated in an absolutely stunning location in the mountains! We could easily explore the region (wonderful hiking, caving, tiny mountain villages), but also enjoyed relaxing in this peaceful location that became our basecamp for 2 days. The staff was excellent - by far the best service and hospitality we received during our 2 weeks in Greece. The entire property is thoughtfully designed and we enjoyed two evenings at the on site tavern getting to know the incredible family who owns and operates the resort. Highly recommend!!! The view is BEUTIFUL. Breakfast is good. The facilities are built potentially to high standard. Reception was polite and tried to be helpful. On site traditional cafe is reasonably priced. Great location, exceptional value, picturesque views, very nice traditional breakfast. The MounTain Resort le superb. It was constructed by a someone who had style, practicality and beauty in mind. The Resort is beautiful with a potential that is amazing. You arrive by car and you are in awe with the mountains, the natural small lake in front of the reception hall. You walk around the natural lake and you see all sorts of flowers and herbs that have been planted. The place is just wonderful and you expect a wonderful stay. We really enjoyed the coffee place and the food there, as well as the whole atmosphere in and around the hotel, and the view. Its the perfect destination for a getaway weekend! The room was amazing, and so was the pool. The breakfast we had the next day was so great that we didn't even get a lunch. Also, the resort is such an amazing place and had all the things one would require. Very clean & quiet, warm & excellent fire place for the winter, really helpful & friendly staff. Location is superb - high up above the village of Anogia and the hotel was really peaceful and quiet. Supper in the tavern was good and breakfast was excellent. Delina Mountain Resort This rating is a reflection of how the property compares to the industry standard when it comes to price, facilities and services available. It's based on a self-evaluation by the property. Use this rating to help choose your stay! Set in an area of 28 acres, this resort combines the fine facilities of a luxurious hotel with the authenticity of Cretan tradition and the wild beauty of the island. Delina Mountain Resort is located 0.6 mi away from Anogia village, on the road towards Nida at an altitude of 3,000 feet. Take advantage of the hotel's prime location to explore the natural landscapes of the island every season of the year. Delina Mountain Resort offers its services for pleasant moments of relaxation and rejuvenation. Take a swim in the indoor pool or indulge with a sensuous massage. Specially decorated rooms which emit a sense of calmness and cleanliness are waiting for you to repel the intensity of everyday routine. When would you like to stay at Delina Mountain Resort? All rooms have fireplace, hot tub and veranda with view of the snowy peaks of Psiloritis mountain. Please note that the 4th person sleeps in an extra bed. A 5th person can be accommodated upon extra charge. All rooms have fireplace and veranda with view of the snowy peaks of Psiloritis mountain. They come with a bathtub or shower with hydro-massage facilities. Please note that the third guests sleeps in an extra bed. All rooms have fireplace and veranda with view of the snowy peaks of Psiloritis mountain. They come with a bathtub or shower with hydromassage facilities. Please note that it is not possible to add extra beds in this room type, only one baby cot. Features a fireplace and a veranda enjoying views of Psiloritis mountaintops. It comes with a bathtub or shower with hydromassage facilities. Please note that any extra guest that is accommodated in this room type is charged as an adult. We would be glad to have the opporunity to host all of our guests and let them enjoy the Cretan traditional way of life. House Rules Delina Mountain Resort takes special requests – add in the next step! Delina Mountain Resort accepts these cards and reserves the right to temporarily hold an amount prior to arrival. There was literally nothing I could complain about. Not a complaint about the actual resort, but be aware that the roads can be quite treacherous if you’re coming from Chania/Rethymno. Google maps lead us most of the way there from Chania and then there was a road closure due to a landslide when we were about 30 minutes away. We had to backtrack and go around and take a terrifying backroad that added more than an hour to our travel time. On the way home we ended up just taking the main road out toward Heraklion (even though it was far less direct) in order to stay on the main roads. Everything was perfect,we had a great time. Would have liked a room with a view. The hammam was out of order, and pool could have been a couple of degrees higher, especially in winter days, but these inconveniences were well coped by the rest of the facilities & staff. The tub leaks a little and there are some flies that get in the room. You can use a cup and move in very slowly to trap and release them back to the wild. I guess they are used to being attacked so they are ready for a quick strike, but don’t pay attention to a slow moving one. The staff were great and the breakfast was excellent. Comfortable mountain getaway. No hot water when the sun was not out. Had to walk out in rain to get to breakfast. Bottle of water only the first day. It is in the middle of nowhere. Driving to and from, as is common on Crete, was terrifying. Staff was so confident and lovely. Buffet breakfast was good. Views were stunning and peaceful. Very solitary and isolated location. Hearing the animal bells was wonderful. Everything else, from the nice spa area over the great view and location to the comfortable bed. The staff was really friendly and helpful. The breakfast was fine, the coffee could be better. I can really recommend the restaurante/Cafe on the same ground. The only minus is the dinner which we booked included and didn't have too many available options. Beautiful place in a very peaceful environment. The staff is very kind and they offered us a welcome drink upon our arrival. They also upgraded our room type for free without even requesting it because they had availability. We are sorry we had to leave early and we didn't have much time to enjoy the fantastic views in the morning. At the time of our visit the WiFi was not working. Waiting for a technician to fix it. Wonderful location just outside Anogia in the Psiloritis Mountains. Good breakfast, although too much for us. Very helpful staff.